September 1, 2018, marked the 19th anniversary of the Ebbetts Pass Fire District providing Paramedic Level – Emergency Medical Care. Residents of the Fire District passed the first special tax authorizing the district to hire additional personnel and begin to provide Advanced Life Support Care in 1999. The Fire District assigned one Firefighter/Paramedic per shift who was assigned to Squad 431 – Shown on the right are Squad 431, Medic 434 and the Fire Districts Command Suburban. Medic 434 is the original Transport Unit owned by the fire district and is a reserve/utility vehicle today. Squad 431, which was the original paramedic response unit, is currently a Fire-Rescue response unit. Shown above are five fully stocked Paramedic Rescue Transport Units currently in service with the Ebbetts Pass Fire District – Two of these units are staffed 24/7 by the district with Firefighter/Paramedic personnel. One Unit is at Station #1 in Arnold and the second Unit at Station #3 in Hathaway Pines. The remaining three units are staffed by call-back personnel as needed. During peak periods it is not uncommon for the district to have three or four of these units committed to patient care or other emergency activities. The Medic Units are continually upgraded and replaced/re-fitted as mileage, wear & tear and age requirements mandate them to be taken off line as first out Medic Units. Some have been re-fitted as District snow plows, flat-bed utility vehicles etc. 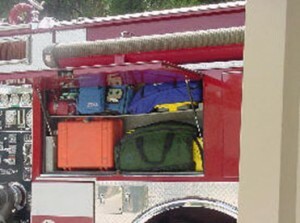 In addition to the advanced life support medical equipment carried on these units – these units also provide structure fire turnouts and Self Contained Breathing Apparatus for the firefighting personnel who staff them, as well as, water rescue equipment, rope rescue equipment and wildland firefighting gear for the firefighters. Three of the Ebbetts Pass Fire Districts six engine companies are also equipped with Paramedic Level – Advanced Life Support Equipment – These Paramedic Engine Companies carry all the same equipment as the paramedic rescues with the exception of the gurney. When in service these engines are staffed with a minimum of one paramedic amongst the crew. Medic Engine 436 has traveled throughout the State of California in past summer fire seasons providing mutual aid on several fires. Medic Engine 437 is the Career Staffed Paramedic Engine at the Canyon View Drive Station #3 in Hathaway Pines. Medic Engine 435 is the Career Staffed Paramedic Engine at the Blagen Road Station #1 in Arnold. The Ebbetts Pass Fire District Paramedic Program provides Paramedic Level First Response service to the entire 225 square mile Ebbetts Pass Fire District. The district boundaries are from Utica Grade to the Alpine county Line on Highway 4, from the Mokelumne River to the Stanislaus River in the high country above Arnold, from the Stanislaus River to Murphys Sheep Ranch Road along Avery Sheep Ranch Road in the county below Arnold. 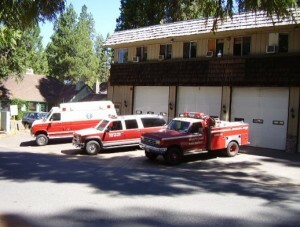 Paramedic transport service from the Ebbetts Pass Fire District includes the Fire District identified above and all areas of the Stanislaus National Forest and Calaveras Big Trees State Park accessed from State Highway 4. Ebbetts Pass Fire also provides transport paramedic services to Western Alpine County – Bear Valley, Alpine Lake and the Highland Lakes area. In 2004, thanks to a second fire/paramedic/emergency service special tax approved by the voters, the Ebbetts Pass Fire District opened a second career staffed fire station in Hathaway Pines. This special tax provides ambulance transport service to local residents and commercial occupancies with no out-of-pocket transport paramedic service and the additional personnel on duty have resulted in lower insurance rates. In June 2006 personnel from Paramedic Rescue 435 laddered an exterior deck of a fully involved single family dwelling fire rescuing two residents from the dwelling. Having the additional personnel on duty that night resulted in a successful rescue. The residents of the Greater Arnold Area through the approved special taxes placed the additional personnel on duty that effected this rescue in those early morning hours.